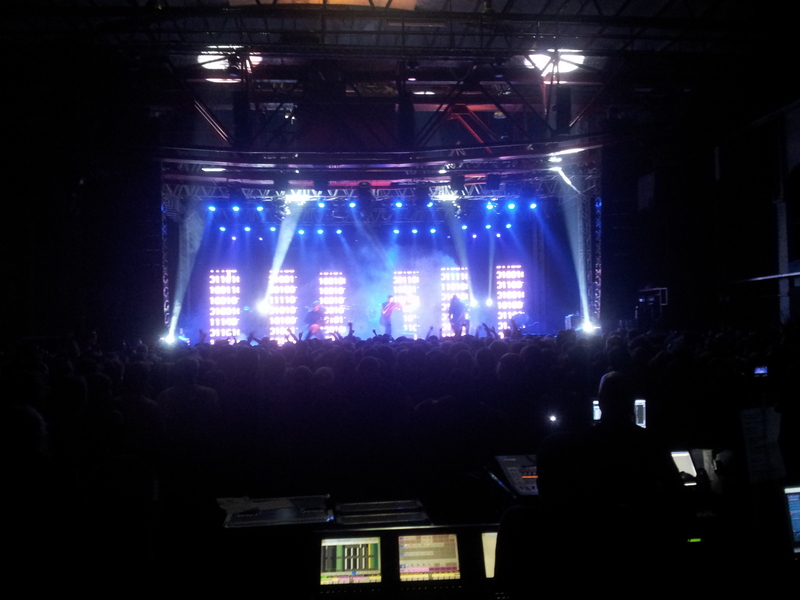 Concert Review: Heaven Shall Burn, 11/23/2013 in Oberhausen by Kai vom Stein - GENRE IS DEAD! So, this show was my last concert of my „concert week“ from November 17 to November 23 and it was also my last concert of the year 2013. As it is HEAVEN SHALL BURN (HSB in the following), it was a very heavy final show! HSB are from Germany and one of the most famous Metalcore bands in world. If you love Metalcore you CANNOT NOT know HSB! The performance was just as I expected: Heavy! We came in and our first destination was the merchandise stand, to get our first HSB shirts. In the background we already heard the first support band starting. After we just got our shirts and our first beer, we went into the hall and saw „Bleed from Within“, a Metalcore band from Scotland. They sounded really good, so we decided to go a few steps to the front. We stopped right behind the mixer console in the middle of the venue because from there we had an awesome view and a perfect sound. We enjoyed listening to the band. What we didn’t know was that they were already the second support act. The first band was called „Adept“, another Metalcore band from Sweden. Doors must have opened much earlier than declared on the tickets, because we only arrived ten minutes after „official“ door opening. In retrospective, I have to say that it was fine though, because after „Bleed from Within“, there were even TWO MORE SUPPORT ACTS. So, HSB had FOUR support bands this evening, which is a little bit too much, in my opinion. The following two bands even confirmed this. Next band was „Dying Fetus“ from the United States, who made a mix of Grindcore and Deathcore. Not really my style. Technically they were pretty good, really fast. But their „singing“ was just growling and pig squeals. I love screaming, growling only in small quantities and I don’t like pig squeals at all. Sorry for the people who like this style, but I really didn’t like this band. At least the next support band was better again. They were called „Hypocrisy“, a Deathmetal band based in Sweden. They made a great show as if they were the main act themselves. I don’t think that I would listen to them at home, but the music was good and the show was just fun to watch. Respect! Now finally the stage was prepared for HSB (it was almost 10:00pm) and I finally got something like excited. For an absolute good reason! Lights went out and writings were shown on the wall to introduce their first song „Die Stürme rufen dich“, which is one of my very favorites! The band came on stage and immediately started rocking their asses off! I only heard HSB live on record before, never watched a video or something before. I didn’t expect that they would move so much and fast, jumpin‘ around and stuff. Also the light-show was awesome and created a blasting atmosphere! Best thing for me personally was that HSB played all of my favorite songs, like „Black Tears“, „Endzeit“, „The Weapon They Fear“, „Hunters Will Be Hunted“, „Combat“, „Land of the Upright Ones“, „Counterweight“, „The Omen“, „Godiva“ and two just amazing songs at the end, „Valhalla“ and „Voice of the Voiceless“. As I said before, I listened to them live on a few records before and I know that singer/screamer Marcus Bischoff almost never keeps the screaming level up, as he loses energy in the middle of a show and just makes a mix of speaking and singing instead of screaming. So this time I was even more surprised that he kept screaming during the whole show! And btw, his screams are no usual screams. He really sounds special, almost like a demon. He really must’ve been in a very good mood this evening. Of course the crowd was totally insane, totally going nuts. I saw giant mosh- and circle pits (This time I wasn’t in there myself, because we really had a great view and awesome sound, as I said before. This time I just wanted to enjoy the show and have fun watching the bands, which is really good sometimes), especially when they supported Bischoff screaming and singing „Valhalla“, so loud and enthusiastic! Another sympathetic point was that HSB showed their social commitment, which only emphasizes their political, social critical and anti-racist lyrics. They showed a trailer of „Sea Shepherd“, an environmental protection organization which cooperates with HSB. So if you think Metalcore bands like HSB only sing about death, devil and more evil stuff, just because their sound seems evil, you failed! HSB really uses reasonable lyrics to create a better world! That’s just one more reason why I like them. You guys like really heavy music with good lyrical content? Listen and watch HEAVEN SHALL BURN!